As China’s Communist Party leaders meet this week to approve an economic blueprint for the next five years, they are likely to make “Internet Plus” a national priority. To understand Internet Plus, take a look at Jiangsu Xicheng Steel. The once enormously profitable steelmaker has slashed its workforce to 2,500 from 8,000 as China’s economic slowdown and a glut of steel factories have pounded prices lower and sunk its profit margins to close to zero. So, too, its competitors. “It’s a game of who can rough it out,” said Yun Qiang, Xicheng’s general manager and the founder’s son. Xicheng has found some help—online. Since taking over international sales earlier this year, the 29-year-old Mr. Yun turned to an e-commerce site called Zhaogang.com, or “look for steel” in Chinese. The site connects Xicheng with South Korean buyers who offer 10% to 30% margins, cutting out layers of middlemen who used to soak up most of the profits. China’s economic downturn and overcapacity have left many once-flourishing companies struggling for survival. This presents opportunities for Internet startups that can help these big but fragmented industries become more efficient. E-commerce sites that aim to help old-line industries find new customers, streamline sales and improve profit margins have proliferated and become among the hottest bets for venture-capital funds this year. The sector could in turn get a boost from China’s Internet Plus push, which calls for integrating the Internet into the country’s old-school manufacturing base. Zhaogang is becoming an increasingly important player in China’s steel market. 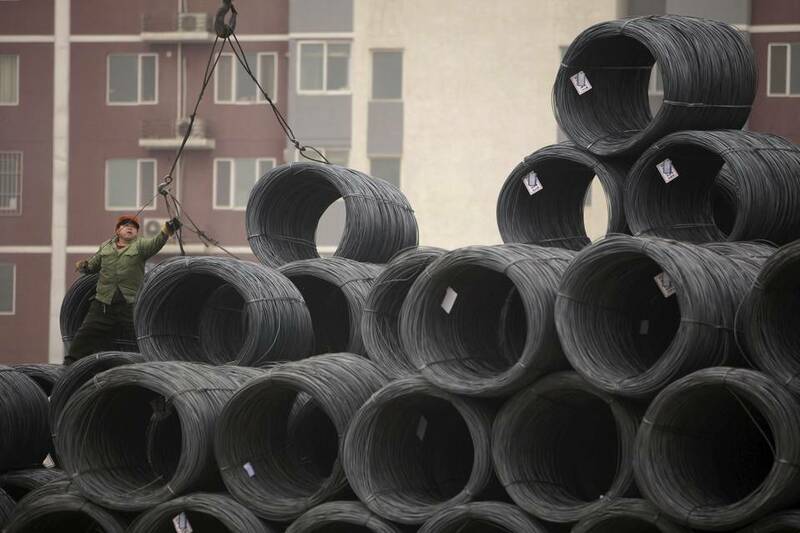 It was founded in 2012, three years after a four trillion yuan ($629 billion) Chinese stimulus plan flooded mature industries such as steel with too much capital. China is now the world’s largest steelmaker but uses about 70% of its steelmaking capacity. Unlike traditional business-to-business sites, Shanghai-based Zhaogang doesn’t charge for industry information. It gets a cut from transactions and provides financing, warehouses and logistics. According to the company, it has signed contracts with over 90 steelmakers and sold to 40,000 customers. It also has signed up over 1,000 trucking companies to provide Uber-like services for Zhaogang’s small-business clients that don’t usually own trucks. Zhaogang traded 20.4 million metric tons of steel last year, or about 2.5% of China’s steel production, and took in revenue of 68.8 billion yuan, according to the company. Closely held, it expects to break even by the end of this year. Jiangsu Yonggang Group, a large steelmaker in China, now sells about 5% of its products through Zhaogang in the country. Wu Yi, sales head of Yonggang and grandson of the founder, says websites such as Zhaogang have the data steel companies need to better align production and sales. “None of this would be possible 10 years ago,” said Zhang Haitao of venture-capital firm IDG, which invested in Zhaogang. The fast growth of China’s consumer e-commerce industry, led by Alibaba Group Holding’s Taobao and JD.com, has educated Chinese consumers and made it easier for businesses to accept the online model, he said. Mobile Internet made it possible for truck drivers to connect to buyers directly in real time, he said. Since November, IDG has invested in 10 similar e-commerce platforms that focus on a specific market such as steel.